AICPIN Expected DA Expected DA from Jan 2018 Expected DA Jan 2018: CG Employees losing interest in Expected DA? 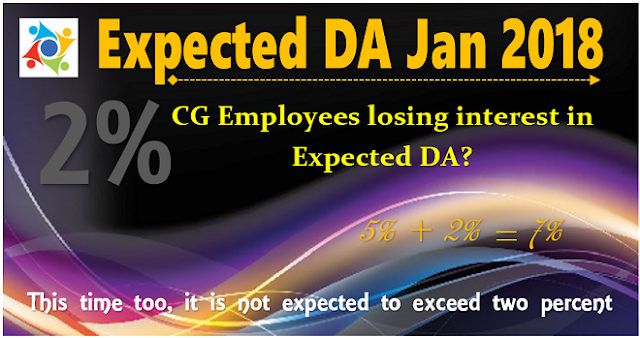 Dear Sir, As informed by you after the 7th CPC we are getting only 0 %, 2 %, 2 % & 1 % DA so far. That is a total of 5 % in this two years. I have not seen any decrease in in the cost of essential items. You just go to a Medical shop or a market. You will know this. It is only increasing daily. You just see the tax amount in a cash bill. You will understand. Definitely there is some thing wrong in the DA calculation after the 7th CPC. You the Union leaders may kindly find out what is wrong. If Govt. is not showing you how it is worked out you can definitely go to a court. Now Hon. Court is giving very good judgements and we are getting justice from the Hon. Judges. Why cant you try this line. If there is shortage of funds you can collect funds for this. So kindly check up the reason for the shortage in DA rates like 1 %, 2 % etc. instead of 10 %, 8 % etc. This is a very serious issue.The employees in service are getting good H>R>A., City Compen.Allowance, LTC, Full Medical reimbursement, higher room rent & very good DA during tour,Bus fare, very good retirement Gratuity. I have worked about 36 years in the Central Government.I have worked about 10 years as a Gazetted Officer. I have worked in Gujarat, Tamilnad, Tellicherry (Kerala), Kozhikode, Cochin, Kottayam, Again at Cochin. etc. etc. My retirement gratuity was far less than Rs.Two Lakh. Now my pension is not even Rs. 30000/- See the pension of a Govt. Secretary, one MLA for 5 years service, his personal staff is getting good pension if the service is just more than 3 years. For us No other allowances other than Rs. 1000/- towards Medical allowance. No LTC., We are also maintaining an old house Imagine the amount required for painting work etc. once in a way. After 60 we have to go to a Dr. at least 5 or 6 times in a month. Similarly the case of our wife also. Who will pay for this. What happened for the insurance suggested by the 7th CPC. Govt. is keeping it for certain modification, say for helping us. But how long it will take to make it an order. Old age pension increase 50 % after 100 years of age. Who is getting this at 100. Any idea ? The answer may be NO. Pl. write to modify this as 20 % at 75, 50 % at 80, 80 % at 82 & 100 % at 85 if Govt. is interested in helping us. While in service so many persons have taken money from the public by one way or other. They have huge bank balance as the amount is unaccounted. They are not worried of 1 % DA increase. About 50 % of Pensioners depends upon this pension only. Suppose there is a major operation for the Pensioner or his or her partner. Who will pay. I have operated my two eyes from Vasan, KTM & Ernakulam. In Kottayam Operation day they have collected Rs. 30000/- & at Ernakulam they have Charged Rs. 35000/- See my difficulties. All medicines I have to purchase again from them. It is now heard that our Ex. Finance Minister Mr. Chidambaram's son is also a share holder in this. There was some raid etc. He has also not helped us. So he too got a share of my Pension thr' back door. What to do. Kindly do some thing for us.At least kindle forward such representations to the proper authorities with your recommendation. Now our Prime Minister is in charge of Pensioners. He is very able and a hard working Prime Minister capable of helping others. That is why he is winning Gujarat again and again. Tomorrow 18/12/17 will be a good day for him. In the next general election also he will come out successful. I am sure. There is no doubt. As on today there is no other popular leader for us other than our Dear MODIJI. So kindly bring such issues to his notice immediately with your recommendations. 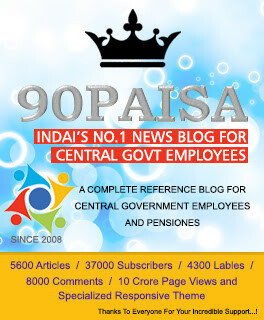 He will definitely help the Central Civil Pensioners. Thanking you, Sir, Yours Sincerely Joy Kaniyamparambil, S. H. Mount POST, KOTTAYAM 686 006. Ph. 9400563626, email kljoy2006@gmail.com. Dated 17/12/17. comments and take initiative to fulfill the needs of group-d group-c and class-2 pensioners. the early response in the matter will help the poor pensioners please. There is no price decrease for relief of consumers/ employees but decrease in DA rate causes hardship to them. The CG DElEd Application Form 2018 has been announced to conduct the examination of CG Pre D.EL.ED 2018 exam in the month of April 2018.